Many homeowners would love to sell their homes without a broker for a variety of reasons. Some feel they are best suited to show off their own property, some want to save in commission costs. However, a real estate transaction is complex and most fail. 2) Contracts and Disclosures: Zetabid’s broker partner provides the required disclosures and local association purchase contracts you must use. 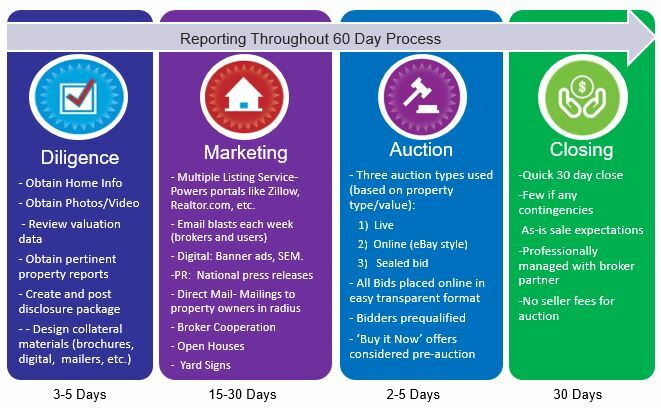 3) Compressed Marketing Cycle: Our process cuts months off the painful conventional home sale process by getting all the market buyers to view the home and compete at the same time. No more cleaning the home for each showing month after month. Our program is free to the home seller when you close. The buyer pays for their own agent at closing and the cost of our services. Zetabid uses a partner brokerage firm at our expense to manage the MLS listing and transaction paperwork. 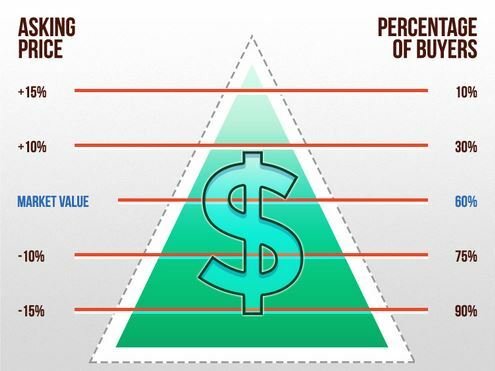 This chart helps illustrate the power of pricing to drive showings. The amount of showings is the single biggest driver of the price you receive. Competition creates urgency and motivation among buyers. Our program is a 15 to 30 day marketing period (you set the desired length) which will get the maximum amount of buyers through your house over two open house weekends (which you host). 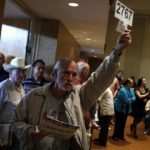 The process can either end with a timed bid deadline to submit offers online or culminate in a three day online auction bidding war. Buyers may also end the auction with a ‘buy it now’ price offer submitted via the website. The timed deadline approach allows two different methods to chose from based on your preference. With homes over a million the auction may be conducted live onsite. MLS: To get maximum exposure, your home needs to be on the local MLS so every buyer in the market can see the home. The vast majority of buyers have real estate agents representing them so without MLS few buyers will see your home. The MLS feeds all the main real estate internet search sites like Zillow and Realtor.com. Pricing: We will list your house at a starting bid price (about 85% of market value) which will drive all the buyers in the market to see your home. Auction listings are the only listing type allowed to use this pricing strategy to drive bidding wars (for most not all markets). You are safe from low ball bids with use of a reserve price (see below bullet point on Reserve Prices). Open Houses: The owner holds opens houses the first and second weekends so buyers can get in before bidding opens. Yard Signs: Zetabid will sell you a yard sign to install on your front lawn (where allowed by HOA and city code). You write your own phone number on the sign. Reserve Pricing: To protect our clients,, listings are subject to receiving a minimum reserve price which is unpublished. Seller is under no obligation to sell or pay fees for offers under the reserve price, but may negotiate with any buyer below reserve at seller option. Offer Deadline Method: Buyers submit their offers using the online offer form with a deadline to submit all offers. You review the offers at the deadline and negotiate with the best offer, or go back with a ‘best and final’ counteroffer. This process works best for sellers who have a fear of the term auction. Online Auction Bidding: All offers are placed online for three days. Open competition optimizes the value of the home. The high bidder is confirmed and a purchase contract is prepared by our broker partner for signature in docusign. We assist with closing where needed and your home transaction closes in 30-45 days depending on the terms you set. All disclosures and contracts are uploaded on the property detail page of the auction website. Additionally, for buyers nervous about the auction competition, they may place a ‘buy it now’ offer at any time. Closing: Zetabid will work with the closing agent to monitor and assist with the closing management process. The home buyer pays for the auction via a Buyer’s Premium which is a percentage of the sales price added to the winning bid. We charge the buyer a 5% buyer premium and half goes to their broker. There are no commissions. We charge a $299 auction retainer up front to cover the cost of the MLS entry, yard sign and auction software which is credited back at closing. This also makes sure our sellers are really attempting to sell their home. Zetabid has vast experience using all media and promotional marketing to attract buyers. Please see our Media Gallery for examples of our marketing.